If you are new to growing apple trees, Red Windsor is one of the easiest and most reliable of all apple varieties. It is self-fertile, so there is no need to worry about pollination partners. It grows naturally in a neat and tidy fashion, and crops heavily. The apples can be picked over several weeks so you don't have to deal with a glut. It seems untroubled by the usual diseases of apples, and the blossom also has some resistance to frost. Red Windsor is a red sport (natural mutation) of a German variety called Alkmene, derived from Cox's Orange Pippin - hence the good flavour. It has a noticeably redder and less Cox-like appearance than Alkmene, although the characteristic Cox flushed striping can usually be discerned. Perhaps most important of all, Red Windsor has a good robust apple flavour with some aromatic qualities. It is fairly well balanced, both sweet and sharp, perhaps slightly sharper than Cox. Red Windsor is grown commercially on a small-scale in the UK, and sometimes marketed as Sweet Lilibet. Red Windsor® is a protected variety. Please fill in the details below and we will let you know when Red Windsor apple trees are back in stock. Lord Lambourne is a popular versatile garden apple variety, with a good balance of sweet and sharp flavours. Red Devil is a good apple variety for the UK garden, and produces a sweet red-tinted juice. Red Windsor is in flowering group 2. Red Windsor is self-fertile and does not need a pollination partner, although fruiting may be improved if there is a compatible tree of a different variety nearby. 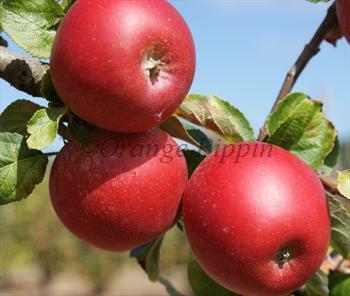 Red Windsor is a great mid-season apple variety for the UK garden. It is easy to grow and crops heavily. As mentioned above, it is self-fertile, a rare feature in apple varieties. Interestingly, Red Windsor is reasonably disease-resistant - this is despite the fact that neither of its parents have a good track-record in this respect. The blossom also has some resistance to late frosts. Red Windsor is a naturally small / weak-vigour tree and grows in a compact style, so it is a good choice if you are short of space. Maiden trees tend to be quite small, without side shoots. If you intend to train the tree as a half-standard then use MM106 or MM111 rootstocks. Being a mid-season variety, Red Windsor is also a good choice for difficult situations where light is limited, or where the summer growing season is short. Red Windsor was developed in Herefordshire in the 1980s as a red sport of Alkmene. 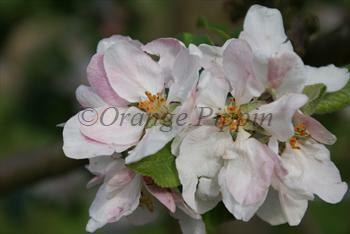 Its parentage is Cox's Orange Pippin and Duchess of Oldenburg.